I have been frequently asked, over the years, about apologetics resources for kids. Parents and children’s ministers are sometimes desperate to find resources that take these important concepts that are often extremely complex and translate them in a way they can be presented and taught to kids. For a long time, there honestly wasn’t much that did this. We are thankfully beginning to see this situation change. One of the best writing in this area is Natasha Crain (her blog is christianmomthoughts.com) . 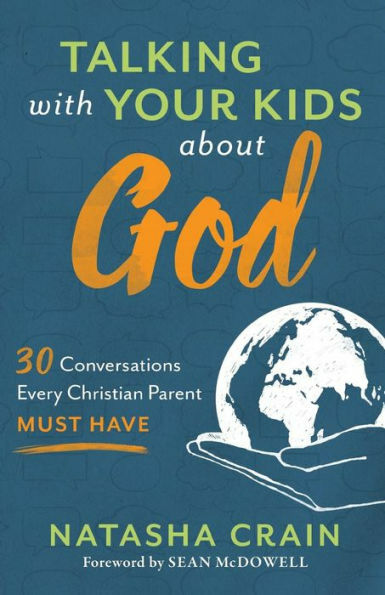 I recently read her Talking with Your Kids about God: 30 Conversations Every Christian Parent Must Have and thought it was terrific. To be clear, Crain’s is not a book for your kids to read. It is a book for parents (or grandparents or anyone who interacts with kids) to help their kids better understand God. There’s of course a place for books that are written for kids to read. However, those books should never take the place of a parent taking the time to be intentional in leading, guiding and preparing their children for the challenges they will face. The aim of Crain’s book is to provide content and strategies that will equip parents to have meaningful conversations specifically about God (30, in total) with their kids. Each chapter is devoted to setting up a substantive conversation between a parent and child on a variety of topics about God. The chapters are relatively brief (around 8 pages). They first lay out the case for a Christian perspective on a particular topic. This serves as the meat and potatoes of what will be discussed. The parent gets good and hard-hitting content that he or she will need to confidently discuss the particular issue on his or her child’s level. After this case is developed, the details are helpfully summarized under a heading of “Key Points” for easy reference. Each chapter concludes with a “Conversation Guide.” The conversation guide has suggestions to start the conversation, suggestions to advance the conversation, and suggestions to apply the conversation. So imagine you would like to help your kids think about and have reasons for believing in the existence of God. Crain provides 6 chapters for having 6 different conversations on this topic! What, for example, can we learn about God and his existence from nature? In this particular chapter, Crain gives a biblical basis for how God has revealed himself in nature and then offers a very substantive run through of what we see in nature that points us to God (which is further elaborated in subsequent chapters). The chapter concludes with suggestions for your conversation with your kid and this is of course what it is all about. A parent is given a framework and very helpful suggestions to have a meaningful conversation about seeing God in the world around us. Some highlights for me in reading the book were the fact that the content of the book is not simply to have apologetics-style conversations with your child, but also theological ones. You can’t talk about God without doing some theology, or so it seems to me. One of the five major sections focuses on the nature of God and even takes on such issues as the doctrine of the Trinity. Each of my kids have, at a relatively young age, wondered about how to understand this difficult concept. I quickly realized that having this conversation haphazardly had the tendency to create frustration. But it is, of course, an absolutely crucial conversation to have. Crain’s helpful suggestion in having this conversation is to walk your child through the provided passages of the Bible that describe the oneness of God, the distinctness of each of the persons of the Trinity, and that each person of the Trinity is fully God. What’s nice about this is that before jumping into the concepts such as essence and personal identity (as some of us may be a bit apt to do), a kid can see the Trinity on display in the pages of Scripture. There’s going to be some mystery here and that’s okay, but a child is building a foundation for doing good systematic theology (probably) without even knowing it. Beyond covering the fundamental issues such as the existence and nature of God, Crain also focuses on relevant issues as well. This is helpful since if you are not up on the current topics you may not know how a flying spaghetti monster serves as an objection to the belief in God. But there’s a good chance your kid will eventually run into this sort of objection. Crain has a whole chapter devoted to it. Or for many of us, we haven’t exactly stayed current on trends in science as it relates to Christian faith. This is a real problem since, especially on college campuses, science reigns supreme. Crain spends 6 chapters covering issues related to God and science with very interesting and insightful suggestions for discussing these issues with your kids. I think Crain strikes a really good balance between having hard hitting content and making it accessible throughout the book. This is one of the most difficult challenges in writing on these sorts of topics for a general audience. On my view, not everything can be made perfectly accessible without sacrificing some accuracy. Some concepts, I think, are irreducibly complex. Crain’s target is a very general one: parents. So her task was to take these very difficult concepts and translate them in understandable ways without sacrificing accuracy. The result is a good blend of challenging material with helpful and relatable illustrations. But the reader should be forewarned. Some of this will strike as difficult material and Crain’s chapters are intentionally brief. She does a terrific job of making it as accessible as it can be, but I suspect many will want and need to look to other resources for some further help understanding all of what is going on. This leads me to the only real criticism I have with the book. What would have been helpful is to have listed resources for further study right there when a parent needs more. This is of course a rather minor criticism since it is not difficult to find resources these days. But for a person who is very new to these topics and may not be familiar with the authors who do good work in these areas, it can be difficult to go further without a guide. The reality is that there are 3000 conversations (and probably lots more!) that you need to have with your child about God, but Crain gives a terrific guide to get into some of the most fundamental and relevant. There are countless number of insights, anecdotes, and analogies that I plan to use with my own children as I talk with them about God. What age group is this targeted? The target of the book is really more parents than a certain age range of kids. The idea is to equip parents with the tools to reach their kids at any age.